The bidding process to place a new high rise bridge linking Beaufort to Morehead City is underway. Construction begins this Spring to replace the current Gallants Channel drawbridge. We’ll talk about the project with the DOT and Beaufort Mayor Richard Stanley. 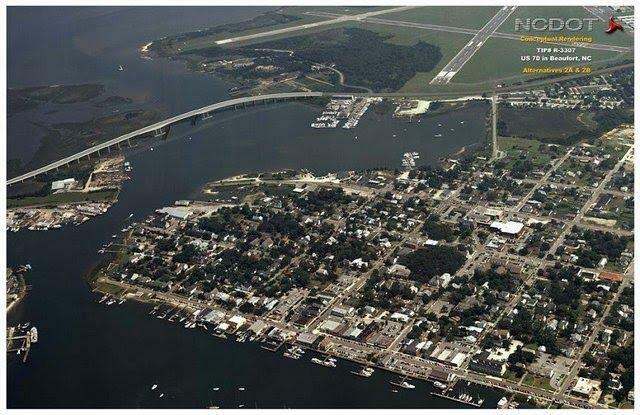 Communing between the coastal communities of Beaufort and Morehead City will be a lot less stressful once a new high rise bridge is operational over Gallants Channel. The project, which has been in the works for 20 years, is currently in the bidding process with construction slated to start this spring. Chairman of the Carteret County Transportation Committee Richard Stanley says the new bridge will mitigate traffic congestion, especially when the drawbridge opens. During the summer, the Graydon Paul drawbridge opens nearly every 30 minutes to allow boat traffic to pass through Gallants Channel. Built in 1957, the bridge is considered so functionally obsolete that parts to repair the bascule drawbridge are no longer available. Richard Stanley, who also serves as the Mayor of Beaufort, says the new high rise will be better for the town in the long run. The idea of a new bridge to replace the existing Graydon Paul span was first proposed in the 1990’s and the DOT started working on the project in 1994. Public hearings were held on six to eight possible routes through and around the town of Beaufort. In July of 2008, the NCDOT proceeded with the roadway and bridge design and entered into the right of way acquisition phase. Division 2 Engineer John Rouse says comments from residents helped them draft the final Environmental Impact statement. While everyone isn’t happy with the plan, Rouse believes the selected alternative meets the DOT's goals of improving the safety and mobility along US 70 as well as eliminating delays caused by the bridge opening at Gallants Channel. He says they also had to consider a highway plan that would also accommodate boat traffic. Whether by land or sea, Mayor Stanley believes the new high rise bridge will make it easier to access Beaufort, which was voted the “coolest small town in America in 2012” by Budget Travel Magazine. He’s also pleased by the economic impact the bridge is expected to generate. Stanley is in the process of working with DOT to salvage the bridge from being completely torn down after the high rise is built. He’d like to see the site used as a boat access and park for the town’s residents. Bids for the contract to build the new span opened Tuesday. A total of eight bids were submitted and Conti Enterprises of Edison, New Jersey was the low bidder of $66.4 million dollars. According to Division 2 Engineer John Rouse, the selection process takes three to four weeks. Rouse says the current traffic pattern using the drawbridge will continue during the construction phase of the project. Once the new span is complete, the DOT will shift the traffic on to the new bridge and start the task of removing the old bridge. The entire project is expected to be complete in late 2017. I’m Jared Brumbaugh.